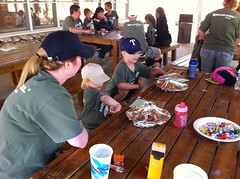 This weekend we took the family to Hand Camp at Camp John Marc put on by the Texas Scottish Rite Hospital For Children. 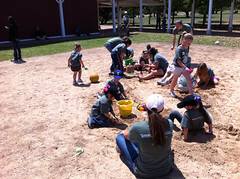 This is a camp for children with a limb difference between the ages of 4 and 9 and their families. 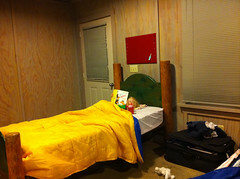 We’ve been waiting to get to go to this camp since Brenden was born and we were told about it. It can be hard to get into because there are only so many spots and lots of families that want to go. We had to apply and they use a scoring system to choose families to come. This was our first year of eligibility and I was so happy when we got selected. We shared a cabin with two other families, one of which was here all the way from Montana! 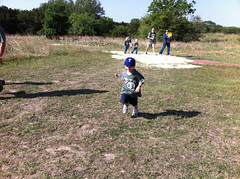 We were signed up for several family activities throughout the day Saturday and Sunday morning. A few times during the weekend, the kids went off to play with other kids their age in groups while the parents broke off into discussion groups. While we’re able to attend most of the Hands Down Support group meetings, several of these other families aren’t able to make the journey. This is their only time of year to get together and discuss their questions and fears with other parents of children with similar issues. 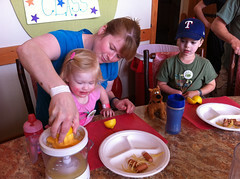 Sometimes it’s just great to hear others are facing similar parenting challenges with their kids as we are. And most of those challenges have nothing to do with having a limb difference! There was a special guest this year. His name is Kevin Laue, and he’s the first Div-I basketball player to only have one hand. It was great getting to hear him talk about the challenges he’s faced getting there. We had a blast and I’m certainly looking forward to trying to go again next year. I’m in the video because at first Emily didn’t want to pour her cup of vinegar. Of course, at the last moment, I see that she does and it’s too late. I felt bad. This entry was posted in Family, YouTube. Bookmark the permalink.